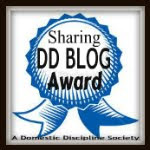 (ourselves included) don't know where to begin when starting out with Domestic Discipline. As far as I understand -half of the term Domestic Discipline is the word Discipline! I personally don't want to start out with a punishment - that's for sure!!! I'm trying really hard to come to terms with relinquishing control - letting Jack sail this ship and being respectful and obedient to his wishes. Hubby doesn't really want to punish me for nothing. This is all new to him too! So if we don't want to start out with a heavy-duty spanking - where do we start? Perhaps with a spanking that helps my hubby to assert and establish his authority. A spanking that says............Hubby is now in charge! Well -- what do we have to work with at the moment? But those terms don't seem to define what we need right now to get things going and to get things on track! "hubby is now in charge" - get over it, work on it, deal with it! and let's things fall into place, in a whole new way. A spanking that helps me to see my hubby in a whole new light - in awe and wonder. A "He's the boss now" spanking and me loving it. So we'll be working on finding a new expression for this and implementing it asap! When you find that term please share, because we need one of those as well. Haha TL same here. I *think* we have our maintenance (or whatever we call it) worked out, well, at least for the next 5 minutes :). I'm sure we will be confused again any day now! Instead of fearing the worst - strive for the best. Discipline should on be used when necessary. When my hubby Jack is 100% sure he is ready to take total responsibility for keeping us on track, he gets the reins for moving us in the right direction! I've wanted him to play an more active role forever! Talk to your hubby about how you feel. No one should go around feeling scared! This is all about love! yeah, Fondles calls those "incentive spankings". keeps it in the positive, you know? We've agreed to call our first "encounter" for an establishing spanking.A spanking where he establishes his role as head of our house with all the responsibilities that entails - keeping it positive all the way! Well I too am SUCH an angel * wink* that finally we just played around for a bit so that our first spanking would happen. We did it to find out which implements made the most noice,and positions that worked. Talking the entire time. This way, although it was awkward, the spanking aprehension was over..Sort of. I mean that helped once the first punishment spanking came into play. That was still awkward. We have decided that maintenance would help him as much as it would me. There is still lots of discussion about how much, how long ect... going on. I've heard from other women, soon he'll be taking off on his own, and my imput will no longer be needed or wanted. But for my new HoH being in a more relaxed atmosphere during administering a spanking is helping him. Well I have been trying to email you to tell you I tagged you in a silly question thing, but I can't email you through my followers and I can't see an email link on your blog...Hopefully you get this info. I can't reply to your mails because it says no reply - but here is my mail address. I'll try and add it to the blog somewhere!